Part of my work in media relations is as a public spokesman for InterVarsity Christian Fellowship/USA. Sometimes I get in the news in other roles. SPJ Task Force on Marquette Tribune advisor dispute. I made my WPRE radio debut in February of 1961 (fourth grade) reading a biographical report on Charles Lindbergh. Employment followed 10 years later, in June of 1971. 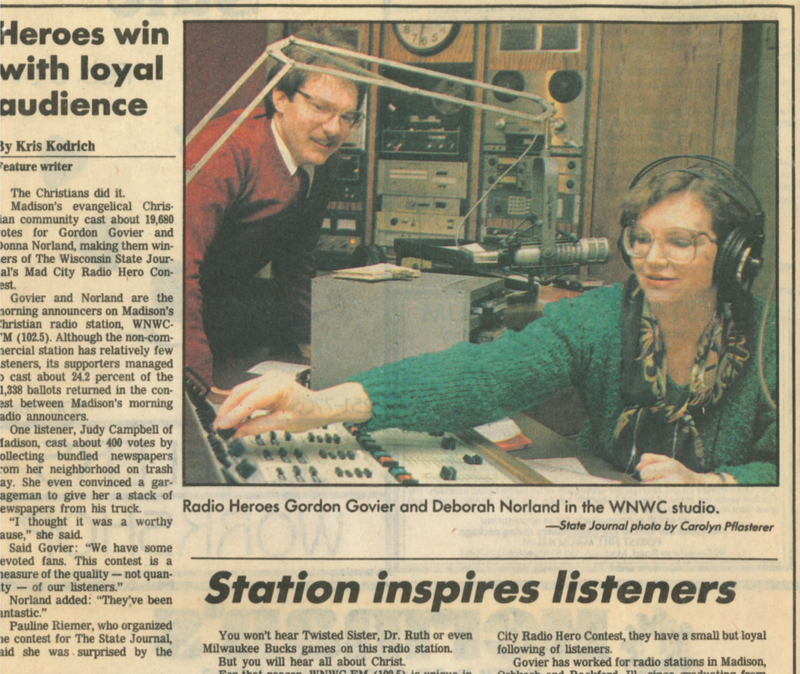 In February of 1987 my WNWC radio colleague Donna Norland and I were voted Mad-City Radio Heroes by the readers of the Wisconsin State Journal. In 2013 I made a cameo appearance on Wisconsin Public Radio's Wha Dya Know radio quiz program with Michael Feldman. A graduate of the University of Wisconsin School of Journalism and Mass Communications, JBA 1973. A member of the Prairie du Chien (WI) High School Class of 1969. Attending City Church - Madison. RANDOM CURIOUS WEBSITES: GOD'S EYE VIEW|| CREATION SITE|| Everybody Has a Story || Journalists' Web Sites|| MINI DISC COMMUNITY PAGE||STEVEN KOZAR|| DISSECT A FROG || THAW A FROG || How Rich Are You? "The Church is the one thing that saves a man from the degrading servitude of being a child of his time." "I couldn't wait for success, so I went ahead with out it."